Thank You, Everyone who attended our OPEN HOUSE at the library on Saturday, October 27! The library had a lot to celebrate this year. Library Director Donna Bunker received an award for being named New Hampshire Librarian of the Year for 2018. The outpouring of support for Donna was awesome. It was such a pleasure to spend some special moments with patrons new and old. ​Several of our 1000 Book Readers attended which warmed our hearts, they grow so fast! The 1000 Books before kindergarten is a great program helping these young folks gain a solid footing in the pursuit of literacy. 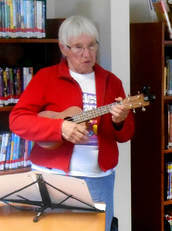 “Sing-n-Strum” at the library on Thursday, October 11, from 5:30-6:30 p.m.
Bonita Hibbard and her ukulele students held a “Sing-n-Strum” at the library on Thursday, October 11, from 5:30-6:30 p.m. Everyone enjoyed this event. ​Boni is a member of Silver Strummers in Dover, Southern NH Ukulele Group (SNHUG), and Tampa Bay Ukulele Society (TBUS) in Florida. If you like ukulele music and you like to sing, plan to join us for this free event. The Chesley Memorial Trustees and staff worked with Meg for several years as she improved our front door garden. She and her husband, Ted, spent many hours in the front garden and in advising us on our children's gardens. Meg kept Honey Bees at her home and loved her Northwood home and its beautiful gardens. We recently learned about Mason Bees and thought they would be a wonderful addition to our library yard in memory of our dear Library friend, Meg McGoldrick. The Mason Bee is known as a gentle bee that lives a solitary life. The bees are native to our area and are known for their cohabitation with humans. They reside in tubes of wood and pack their eggs in a special nutritious mud that sustains their young. The Mason Bee is considered the hardest working bee as they simply pollinate and do not produce honey or a hive. Thus, we will have more food with their assistance with no fear of stinging. We have added a book to our Library on the Mason Bees (Mason Bee Revolution: How the Hardest Working Bee Can Save the World One Backyard at a Time by Dave Hunter and Jill Lightner) should you wish to consider them for your home as well. Rebecca led off with her yankee yarns and Joel added spice to her repertoire with stories about beans, cuttin cheese and ladies hats from Calef's Country Store days. Cordwood's notes were clear, clean and crisp. They strummed, picked and plucked their guitars, banjos and washboard to some really fun bluegrass. The crowd loved it all clapping so loudly that the noise resounded off the old masonic halls walls. Great music and commentary filled the room for over 2 hours. It was a night to remember. The New Hampshire Division of Public Health services provided an informational presentation on tickborne diseases. The presentation covered topics including: the signs and symptoms of tickborne diseases that cause illness in New Hampshire; the epidemiology and distribution of tickborne diseases in New Hampshire and throughout the United States; steps to take to prevent tick bites and transmission of tickborne diseases; and proper tick removal and disposal. Here are two of the informational pieces provided by our speaker.